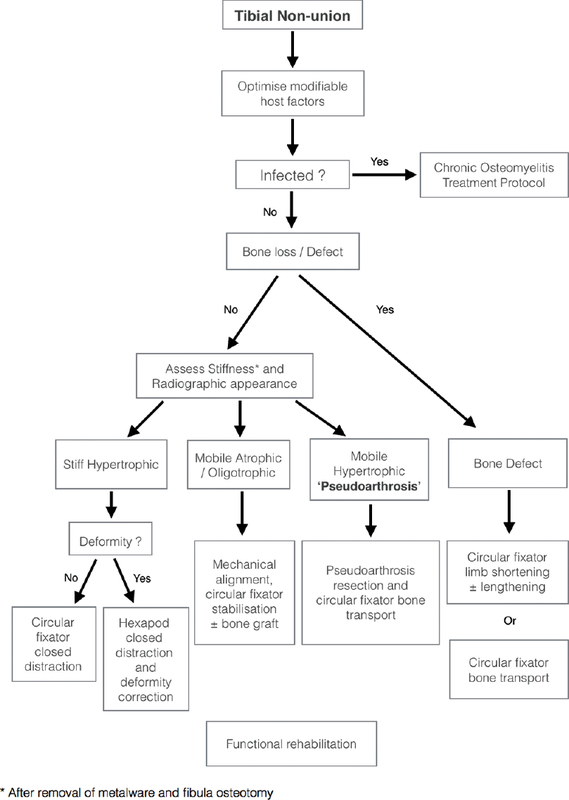 The management of large bone defects, atrophic nonunions, and other conditions with poor bone formation presents a formidable challenge to the treating physician, as all available techniques of bone reconstruction have drawbacks. Recent advances in stem cell biology, specifically adipose tissue-derived mesenchymal stem cells (ASCs) and adipose tissue stromal vascular fraction (SVF), have opened up new horizons by providing a reliable and abundant source of stem cells with osteogenic potential that can be used in various bone tissue engineering techniques. In this review, several aspects related to the use of ASCs are addressed, such as harvesting and processing of adipose tissue, advantages of ASCs over bone marrow-derived mesenchymal stem cells, mechanism of action and safety of ASCs, and factors affecting the differentiation of ASCs. Published reports on the use of ASCs in critical size defects, nonunions, and distraction osteogenesis are also reviewed. Innovative trends in stem cell research on musculoskeletal pathologies are highlighted, with special emphasis on the increasing evidence that the direct application of freshly prepared SVF processed from adipose tissue into the bone defect to be treated without a prior differentiation or an ex vivo expansion and culture is possible. This highly promising approach may lead to the development of a one-step intraoperative cell therapy. Background: Lower limb deformities have a substantial impact on the quality of life (QOL) of children. 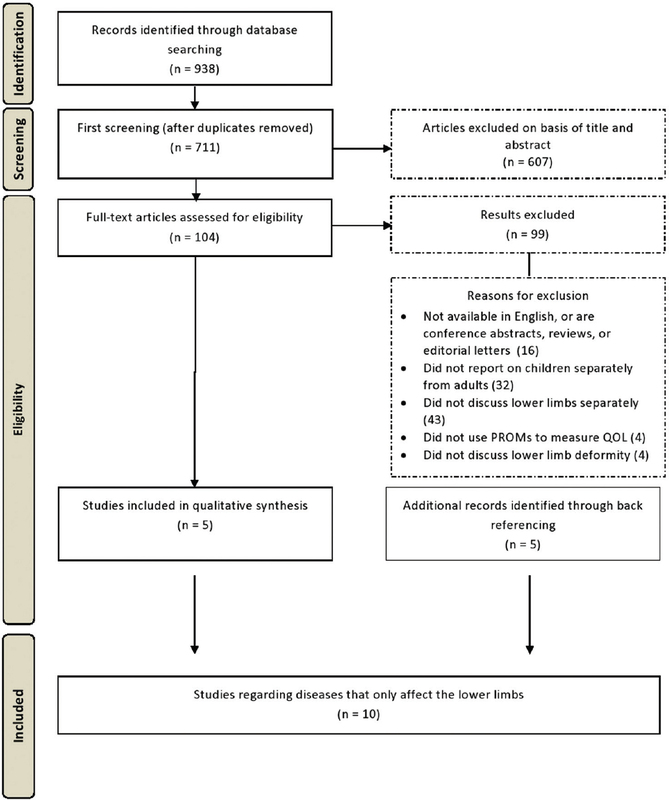 This systematic review was conducted to identify as follows: (a) QOL concepts in existing literature specific to pediatric patients with lower limb deformities; (b) parent-reported outcome and patient-reported outcome (PRO) instruments used to measure QOL in pediatric patients with lower limb deformities; and (c) determinants of QOL in pediatric patients with lower limb deformities. Methods: MEDLINE, EMBASE, CINAHL, and PsycINFO were searched from the inception to January 2016. Studies were included if they (1) had patients with lower limb deformities; (2) included children 18 years of age or under; and (3) measured QOL using a PRO or parent-reported outcome of instruments. 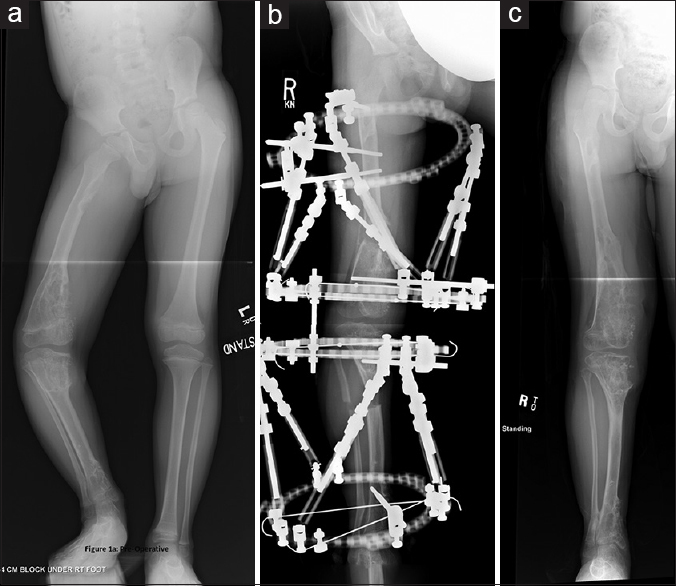 Results: Of the 938 publications identified in the search, 10 studies used a total of 24 PRO or parent-reported outcome instruments to measure 1 or more aspects of QOL of pediatric patients with lower limb deformities. Three overarching health concepts (physical, psychological, and social health) and 15 subconcepts were identified. Five studies looked at determinants of QOL including type of deformity, severity of deformity, complications postsurgery, stage of treatment, and type of treatment. Psychological health was measured in 10 studies, social health in 7 studies, and physical health in 6 studies. The most frequently measured subconcepts were physical function, psychological distress, and social function. Conclusion: Existing parent-reported outcome and PRO instruments measure 3 QOL concepts in children with lower limb deformities. There were no validated PRO instruments specifically designed to measure QOL of children with lower limb deformities. Level of Evidence: This was a systematic review of level III studies. Background: Tibial nonunions pose significant treatment challenges despite the regularity with which they are encountered. While several studies have reported the outcome of treating different nonunion subtypes with various strategies, few have investigated the factors that influence treatment and outcome. Aims: This study aims to identify factors that complicate the management of uninfected tibial nonunions and are associated with failure of treatment. Materials and Methods: We retrospectively reviewed all patients with uninfected tibial nonunions who were treated according to a standardized treatment algorithm over a 5-year period. Results: The final cohort consisted of 84 patients with a mean age of 36.5 years (range 5–68 years). Bony union was achieved in 79 out of 84 (94%) tibias. Malalignment (P < 0.001), smoking (P = 0.008), alcohol use (P = 0.039), and time from injury to nonunion management (P = 0.003) were found to be associated with treatment failure. The factors found to be associated with increased treatment complexity were smoking (P = 0.035), alcohol use (P = 0.011), and time from injury to nonunion management (P < 0.001). Conclusion: General orthopedic surgeons should, therefore, refer these patients to reconstructive surgeons as soon as the diagnosis of a tibial nonunion is made while reconstructive surgeons should note the importance of host optimization and mechanical alignment during the management of these conditions. Background: Ollier's disease is a non-hereditary skeletal disorder. Orthopedic management of limb length discrepancy could be complex given the nature of bone pathology, the significant amount of length discrepancy and the difficulty to predict it. The goal of the study is to identify the outcomes and complications associated with surgical management of limb length discrepancy. Methods: This is an IRB approved, retrospective review of patients with Ollier's disease who had limb lengthening. The age at the time of surgery, amount of total length discrepancy and discrepancy for each individual bone, amount of lengthening and as a ratio to the length of the bone itself, type of fixator, duration of the fixator, complications are recorded. Unpaired T-tests evaluated the effect of simultaneous versus single-bone lengthening and tibia vs. femur being lengthened on the external fixator index. One-way ANOVA test was used to evaluate the effect of osteotomy location on mean External Fixator Index (EFI). 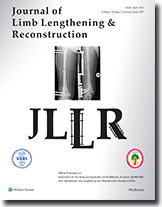 Results: 14 patients with 40 segmental limb lengthening procedures are identified. The mean LLD was 7.1 cm and mean amount of length gained was 7.8 cm. Follow up was minimum 2 years and maximum 18 years 2 months. The average fixator duration was 178.6 days. The average percent of lengthening through each bone was 19.2. The average EFI was 36.5 days/cm. There was no difference between tibia vs. femur and between simultaneous vs. single bone on EFI. There was no difference among osteotomy type. There were 3 cases of nonunion, one delayed union, 5 cases of premature consolidation. One case had fixation failure. There were 7 cases of knee stiffness of which 3 cases required surgery. Conclusions: Our study shows that Enchondromal bone appears to respond to lengthening with a structurally proper regenerate. Premature consolidation needs to be always kept in mind and appropriate adjustment should be made in the rate of lengthening. 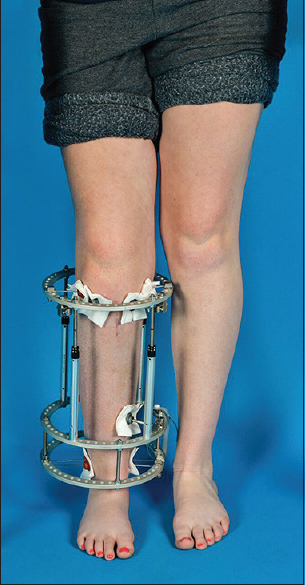 Background: Hexapod external fixators often incorporate bone lengthening as part of a multi-planar deformity correction plan. The hexapod struts, however, do not distract in the direction of bone lengthening. Their oblique orientation to the ring creates a vector that is the summation of multiple individual strut adjustments. We demonstrate that a 1 mm lengthening of each of all six struts always created more than 1 mm of lengthening at the bone. Methods: The amount of lengthening was analyzed with the Taylor Spatial Frame™ (Smith and Nephew, Memphis, TN, USA) software using two different methods. Results: As the strut lengths got longer the ratio got closer to one but it never reached 1.0. Conclusions: This information is critical when using very short struts or very large rings. In these two scenarios, the Δ frame height relative to the Δ strut length becomes much greater than one. Clinical Relevance: A strut length much greater than one will cause the bone to lengthen much faster than the surgeon desires. It may also lead to unhealthy regenerate bone formation and could create delays in bone healing. 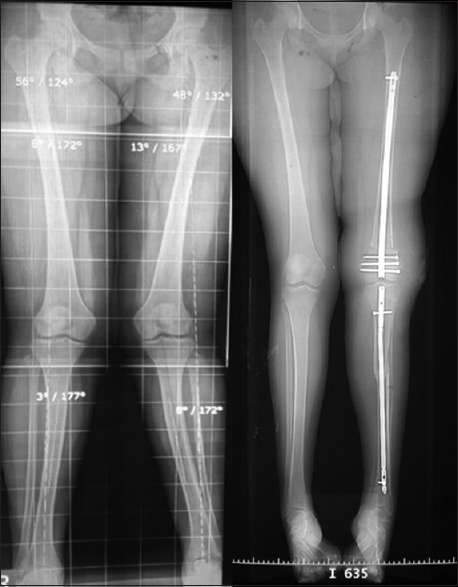 Introduction: Fixator-assisted plating (FAP) and fixator-assisted nailing (FAN) have gained popularity recently in correcting deformities due to their advantage of combining the accuracy of deformity correction offered by external fixator (that is removed at the end of surgery) with the convenience of internal fixation for osteotomy fixation. The advantage of one method over the other is not yet clear and there are limited reviews in literature in this regard. We asked whether one technique has an advantage over the other as regards the ability to correct the deformity, blood loss, knee range, time to union, and complication rate. Methods: We identified 18 patients who underwent distal femoral osteotomies, 6 patients underwent FAP and 12 patients underwent FAN. We compared the accuracy of correction, duration of surgery, preoperative and postoperative knee range, and complications. Minimum follow-up was 13.4 months (6–18 months). Plates were used in skeletally immature patients or in skeletally mature patients with thin thighs, while nails were used in skeletally mature patients with big thighs. Results: We achieved the desired correction in all the 18 patients. Union was quicker with plates, but this could be attributed to the younger age of patients in that group. 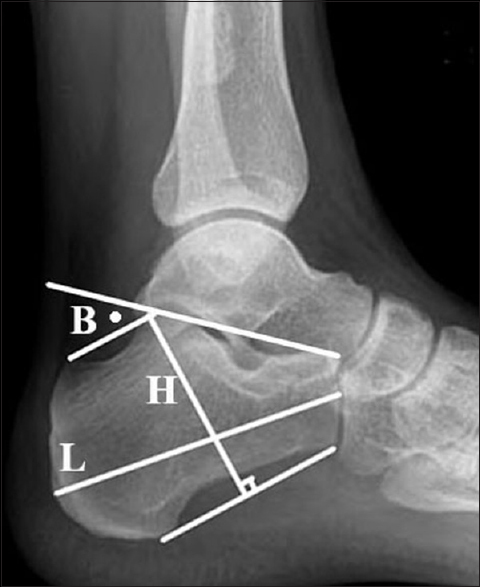 There was no statistically significant difference between both techniques that may point out that one method is superior to the other as regarding deformity correction (based on percentage improvement in mechanical axis deviation as compared preoperatively and at final follow-up). Preoperative and postoperative knee ranges were similar for both techniques and there was only one case of recurrence that had bone softening disease. Conclusion: Both techniques can be used to achieve correction with no statistically significant differences, and the choice between both techniques can be left to surgeons' or patients' discretion. Level of Evidence: Level III, therapeutic study. Background: Treatment of displaced intra-articular calcaneal fractures (DIACFs) is still controversial. Aim: The objective of our study was to assess the capability of using Ilizarov frame as a minimally invasive technique to improve foot function and restore calcaneal length, height, width, and Bohler's angle in patients with DIACFs. Patients and Methods: We retrospectively reviewed forty patients (mean age, 25.4 ± 9.6 years, a mean follow-up of 44.9 ± 6.9 months) with 48 closed DIACFs who underwent indirect reduction and external fixation using Ilizarov technique. We applied distraction technique through the mechanical axis of the leg and through the foot axis. The drop wire technique was used to restore depressed subtalar fragments. Bone graft was not used. Results: We achieved good alignment in all cases except four feet who had varus deformity. The mean American Orthopaedic Foot and Ankle Society score was 84.6 ± 5. Superficial pin tract infection occurred in 7 feet. Skin pressure necrosis was seen in 3 feet. Statistically, all radiological measures were improved and significantly different from those measured preoperatively. 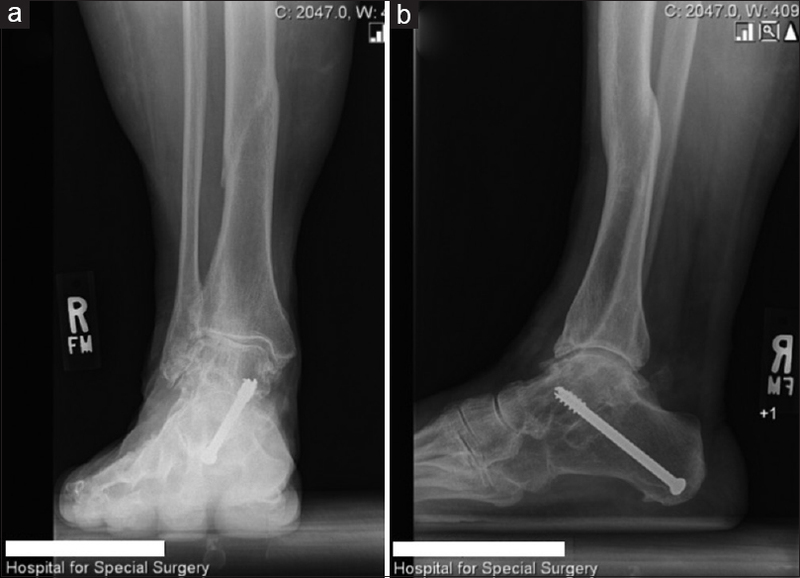 Conclusion: Closed reduction of DIACFs using Ilizarov frame provides a good functional foot outcome with a low risk of postoperative complications. It also has the capability of restoring normal anatomy of the calcaneus. Total ankle replacement (TAR) aims at reestablishing a functional and painless ankle joint while maintaining motion and preventing adjacent joint arthritis. TAR can be complicated by comorbidities such as ipsilateral knee arthritis and deformity with subsequent arthroplasty and/or other lower extremity malalignment issues. We present a case of a 67-year-old female with severe right ankle pain and a history of ipsilateral subtalar and calcaneocuboid fusion, bilateral total knee arthroplasty, and a malunion of a conservatively treated ipsilateral segmental tibial fracture. Following TAR, there was recurrent lateral hindfoot pain due to subtle malalignment from the tibial malunion which resulted in persistent hindfoot valgus. This caused symptomatic subfibular impingement in addition to limb length discrepancy. To address that, a circular external fixator was applied to realign the ankle and lengthen the tibia, eliminating pain and avoiding complications with either implant.